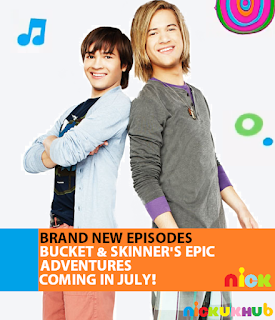 NickUKHub: Nickelodeon UK & Ireland to Show Brand New Bucket & Skinner's Epic Adventures in July 2013! Nickelodeon UK & Ireland to Show Brand New Bucket & Skinner's Epic Adventures in July 2013! Nickelodeon UK & Ireland has announced the very exciting news that after nearly a nine month hiatus, Bucket & Skinner's Epic Adventures will be returning to the regular Nick UK & Éire schedule with brand new episodes this July, part of Summer 2013 on Nick UK & Ireland! All times, dates and episode names are still currently unannounced. Bucket & Skinner is shown on Nickelodeon UK & Ireland every weekend morning at 6:30am (7:30am on Nick +1).